– The greatest nuclear disaster of all time on 26 April 1986 at the Chernobyl Nuclear Power Plant in the city of Pripyat was then located in the Ukrainian Soviet Socialist Republic of the Soviet Union. This historical fact is extremely significant. For this carefully planned terrorist operation was one just one prong of multi-pronged attack strategy against the USSR, each of which was designed to cause the breakup of the Soviet Union. Only when viewing this manufactured calamity through the lens of the history of the collapse of the USSR, and especially the recent Western war against the Ukraine, can the truth be correctly understood. Nothing happens with catastrophic impact in the Russian Motherland except by the long arm of the Zionist Khazarian clan which covets their ancestral lands. 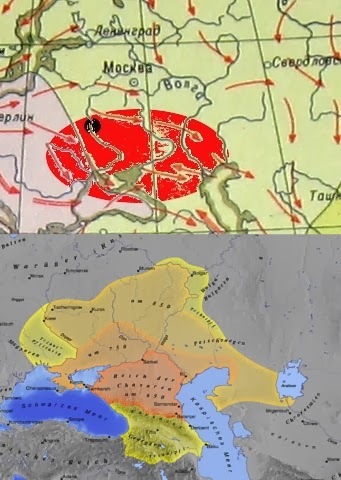 Those ancestral lands of Khazaria happen to be located in and around the Ukraine and are comprised of large areas of various contiguous countries. The report posted below in its entirety on the Chernobyl nuclear disaster represents a critical part of the scheme which was cooked up by the Zionist cabal in Tel Aviv, London and Washington. One of the best ways to vacate a large geographic area is to stage a major environmental disaster there, just like the same perpetrators did with the Fukushima nuclear catastrophe and the BP Gulf oil spill. Only in this way can the clandestine plans of their takeover agenda be efficiently implemented. When the revised history is finally written, the Ukraine will be properly understood as a nation that was the site of a staged nuclear terror operation the likes of which the world had never seen. That the Chernobyl nuclear catastrophe was a quite meticulously preplanned event designed by the Zionist cabal to scare the populace into a pen of compliance is no longer in doubt. It should be pointed out that Chernobyl is located only a stone’s throw from Kiev, just as Fukushima is a relatively short distance from Tokyo. 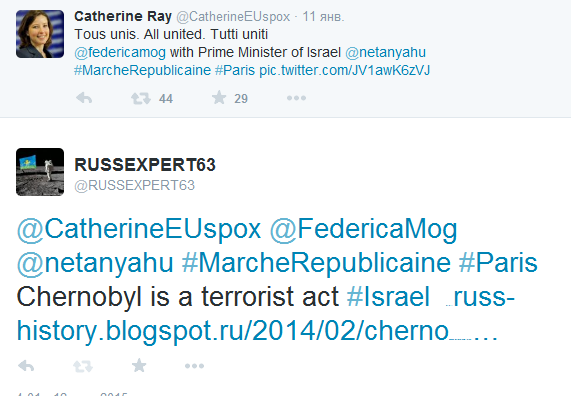 Ukraine, American Jewish Fascists Attacked Russian Speakers! An article for attorneys and intelligence officers. In the fall of 1986 the USSR military personnel in the ranks of colonels and candidates, doctors of technical sciences came to the unequivocal conclusion that Chernobyl disaster was a terrorist act, a sabotage. About this was openly reported in military technical Universities of the USSR and it was no secret for the military. For the unprepared reader it was difficult to cover everything and to draw a conclusion. In 1986, it was not known who was the perpetrator and why it was done. Today all is known, publicly available and links to scientific publications can be provided. Due to the fact that now there are many texts about the Chernobyl it is difficult for the unprepared reader to engulf everything and draw a conclusion,so this article does it for him.In accordance with the UN Commission’s report, the Chernobyl disaster began on April 26, 1986 at 1:23:40, when the operator, during the experiment, pressed the button blocking automatic protection of the reactor from overloading. This man died in a hospital from radiation, not realizing what was his fault. No one still has explained to the population the objective picture of why the reactor exploded when the button was pressed, and what were the results of the investigation. Information for lawyers and intelligence officers all over the world. Information about the explosion at the Chernobyl Nuclear Power Plant (ChNPP) from the military technical experts. In nature chemical element Uranium consists of two isotopes: 0.7% of the isotope of atomic weight 235, the rest is an isotope with an atomic weight of 238. Fuel is the only isotope of uranium-235. During capture (absorption) of a neutron by a nucleus of uranium-235 it becomes unstable and almost immediately splits into two, mostly unequal parts, with the release of large amounts of energy. In each act of fission, the released amount of energy is millions times more than the combustion of a molecule of oil or gas. In such a large reactor as Chernobyl, when working at full power, it burns down about four kilograms of uranium per 24 hours. Usually in power reactors they use not natural, but enriched Uranium by the isotope-235. Mostly, it’s uranium-238 and therefore a significant amount of neutrons is absorbed by it. The nucleus of uranium-238, after absorption of a neutron, becomes unstable and via dual decomposition is converted into chemical element plutonium-239, which is also able to split during absorption of thermal neutrons same as Uranium-235. 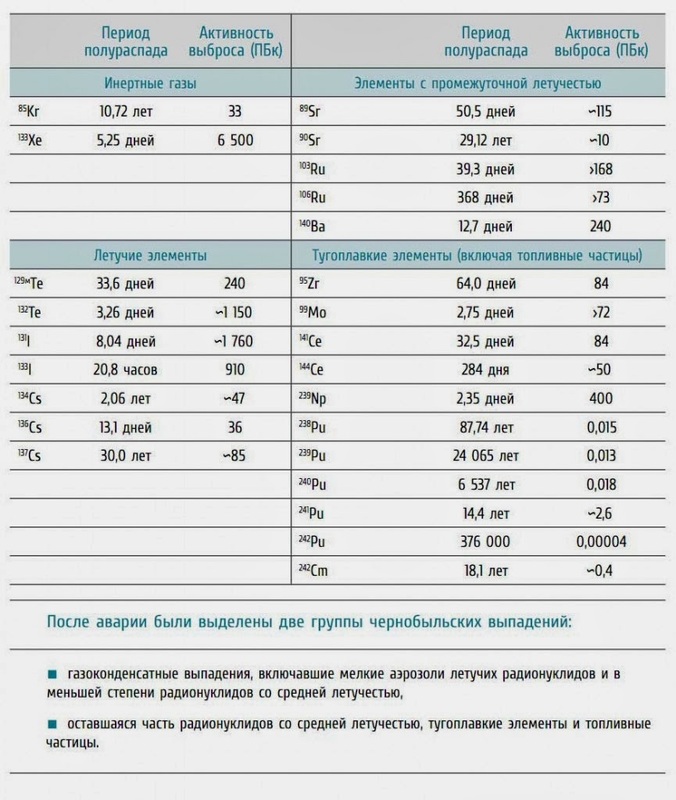 Properties of Plutonium as a fuel are different from Uranium and at a sufficiently large accumulation, after prolonged operation of the reactor, they slightly change the physics of the reactor. The services of nuclear station periodically replace the depleted fuel elements which is recorded in the logs of the station. There was nothing outstanding in the test program of the reactor; it was just a normal test program to check the status of the turbine and its bearings. The program received fame only in connection with the accident that occurred when using it. There is no technical connection between the accident and the test program. Testing of the reactor on the one hand masks the diversion with the acts of the personnel, on the other hand the key stage is the last one: the reactor stopping at a given time. If prior to testing, automatic triggering of the protection system had happened by itself, the accident would have happened just the same. Having considered all the documents, the Commission’s investigation found no variations from the normal parameters, not until the moment of pushing the emergency protection button (AZ). Centralized control systems, in particular, the program DREG did not register until 01 hour 23 minutes and 40 seconds before pressing the AZ, any changes in the parameters of operation of the reactor devices and there were no technical reasons for the activation of the emergency protection system in automatic mode without operator intervention. The State Board of Atomic Industry Supervision Gospromnadzor under the chairmanship of Brunsh Valery Ottovich collected and analyzed a large number of materials and, as written in the report, was unable to establish a reliable cause of tripping AZ in automatic mode. Thus, the reactor was stifled upon completion of work by the operator himself. At 01hr.23 min.40s was registered pushing the button of AZ reactor to stifle the reactor after stopping of work. This button is used both in emergencies and in normal conditions to stop the reactor. The rods of the control system and protection system (CPS) in the amount of 187 pieces went into the active zone and by all canons had to interrupt the chain reaction, but it never happened. At 1hr 23 min. 43 sec. was registered the appearance of alarm signals of excess capacity and reduction of the period of acceleration of the reactor (big speed increase power). These signals should trigger the core system and the AZ rods should go into the core, but they come from pressing the AZ. There are other emergency signs and signals: capacity growth, increased pressure in the cooling system, etc. At 1hr. 23 min.47s. there was an explosion which shook the whole building, and after 1-2 sec there was an even more powerful explosion. The rods AZ have stopped not having passed half way. In such everyday settings the RBMK-1000 reactor of the fourth unit of the Chernobyl nuclear power plant was blown up by the button of emergency protection (AZ) in seven seconds. The operators of the station in principle were unable to do anything. The RBMK reactor is geometrically large. Its separate parts can behave as independent reactors. If AZ is triggered, when a large number of rods simultaneously go into the zone, in the lower part of the zone a local critical mass can be created by the rods and a nuclear explosion may occur. When the rod of the protection system is still in an intermediate position, the water from the bottom of the channel is already squeezed out and activation of the fuel at the bottom begins. I.e. during the motion of the rods down at the initial stage of plugging of the reactor, on the contrary they begin to activate the reactor and only then they jam it. When a reactivity margin is large, the system of emergency protection (AZ) copes with its purpose. When it’s small, it fails. AZ can bring in positive reactivity and according to the estimations after the accident, in the amount of “up to one beta”. Only after 5 to 6 seconds the protection begins to fulfill its purpose and suppresses the reactor. The reactor exploded on the seventh second. Reference: “the Value to one of the beta” – meaning the multiplication factor of neutrons is greater than one. About the physical principles of operation of a nuclear reactor, see page in the network . On April 26, 1986, after clicking AZ button, protection went off at full volume and blew up the reactor. 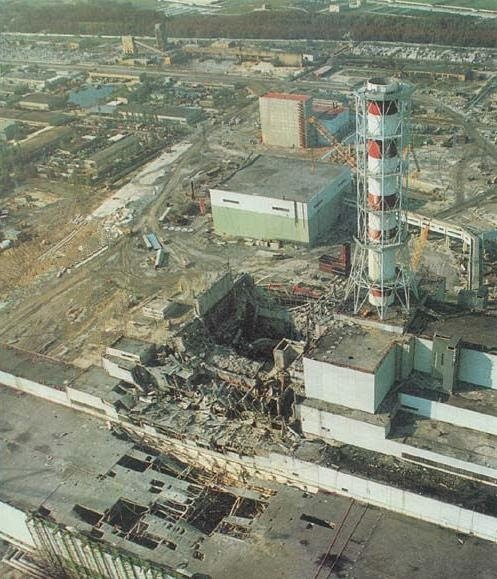 In 1975, at the first unit of Leningrad Nuclear Power Plant, during exiting for power after tripping AZ, an accident has occurred with rupture of the technological channel due to overheating of a small part of the active zone. To reduce the power in this part by immersing the rods here and retrieving them in other places was not possible. 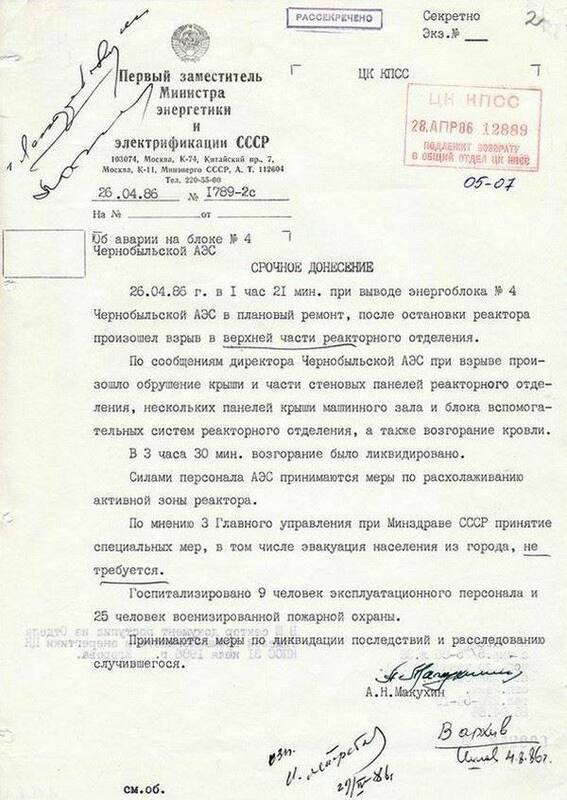 Thus, 10 years prior to the Chernobyl accident, scientific workers of the Kurchatov Institute of Atomic Energy and the Dollejalle Scientific Research Construction Institute of Electric Technology in Moscow knew about the effect that occurs during lowering of AZ rods and acceleration of the reactor at the initial stage of its stopping. Technical justification for upgrading was put down on paper and of course it became known to the interested persons in the USSR and the USA, who have had sufficient time to test and mathematically model the accident. They could mathematically calculate the formation of a local critical mass in the lower portion of the core and at a certain fuel composition predict its explosion. The acceleration of the reactor, which happened on the night of 26 April, was fundamentally impossible during normal content of the fuel. That is, if the fuel reactor corresponded to the regulations, then such acceleration of the reactor in any case would not have happened, and it wouldn’t have exploded. In the active zone was deliberately introduced fuel of additional emergency composition – from nuclear submarines with a large production of plutonium 239. Information about this was openly published by a nuclear physicist Nikolay Kravchuk. Nikolay Kravchuk graduated from the Department of theory of the atomic nucleus physics faculty of M. V. Lomonosov Moscow state University and conclusions were reviewed by the Professor, doctor of technical Sciences I. A. Kravets and doctor of physics and mathematical Sciences V. A. Wyszynski. From April1 through April 23, 1986 “the stat of the active reactor zone has changed significantly. Such changes have occurred not accidentally, but were the result of well planned, implemented in advance actions”, says Kravchuk: “On the fourth unit was contained the maximum amount of radioactive materials up to 1.500 Mki. By the time of testing, the reactor was in an extremely unstable state with power drops. In addition, in some cells of the reactor there was more highly enriched fuel from nuclear submarines (plutonium-239)”. , . A small portion of the active zone of the reactor has exploded as a result of immersion of the graphite rods to stop the reactor. Instead of reducing the activity area there has been a sharp increase in the activity at the initial stage of immersion rods with abnormal fuel in the reactor, which was the technical cause of the explosion of the nuclear reactor. The fact itself of downloading of non-standard active elements created the conditions for the explosion of the station, and the stopping of the reactor after the experiment became the trigger for the explosion. Emergency protection (AZ) has become an accelerating device. “The explosion of a nuclear plant will kill hundreds and from radioactive contamination millions will die” and this thesis is understandable to all military and people with higher technical education. That’s why this stage of sabotage should be considered separately and it is the most visible. Nicholas Checherov who for 20 years explored the inner parts of the reactor – from 1986 to 2005, gave an interview where he said that he and other researchers were able to see almost all the rooms of the fourth unit of the Central hall and all the space under the reactor. He reports the following: “We managed to explore all the places of accumulation of fuel-containing melts, and it became clear that the melts ended up in pool-bubbler (capacity intended for reception of steam in the event of an accident). No steam explosion, which the state Commission so feared, has happened. In the reactor cavity and the room underneath also no trace of any explosion was detected. Visible destruction, i.e. the one that we had seen with our eyes indicate that the explosion happened right in the Central hall. There was only one blast, and it was nuclear,” the scientist said. The scientist reports that during the inspection of the mine it turned out that it was empty. “Moreover, we found no traces of burning in it, even the paint on the metalwork was intact”. Checherov claims that all the reports in the newspapers that the graphite in the reactor burned for nearly two weeks is absolute nonsense. “This is all from ignorance of the fact that the RBMK graphite does not burn. This legend was necessary to declare the existence of an active zone in the mine,” said he. “We, humanity as a whole, specific countries and most of the people caught in the area affected by the nuclear accident, managed to survive in a nuclear catastrophe. With difficulties, with losses, with enormous moral and psychological costs, but still we survived. You also need to realize that it was one of the largest reactors in the world, and, apparently, reactor accident worse than Chernobyl on the planet, in principle, can not be”, – said Mykola Checherov . Nuclear explosion of the active part of the reactor core that occurred has spewed up to the stratosphere many dozens of tons of radioactive substances and this emission, regardless of the events at Chernobyl, had to be fixed by all other civil defense services and the military. The military-political situation in 1986 was that the USA were literally threatening the USSR with a nuclear attack. The forces and capacity of Civil defense were at the highest level of readiness, which was never before and not since. Military units of strategic missiles and medium-range missiles in Belarus and Ukraine conducted radiation monitoring in automatic mode and regardless of the presence or absence of information about the Chernobyl accident they had to respond on their own and they did respond. 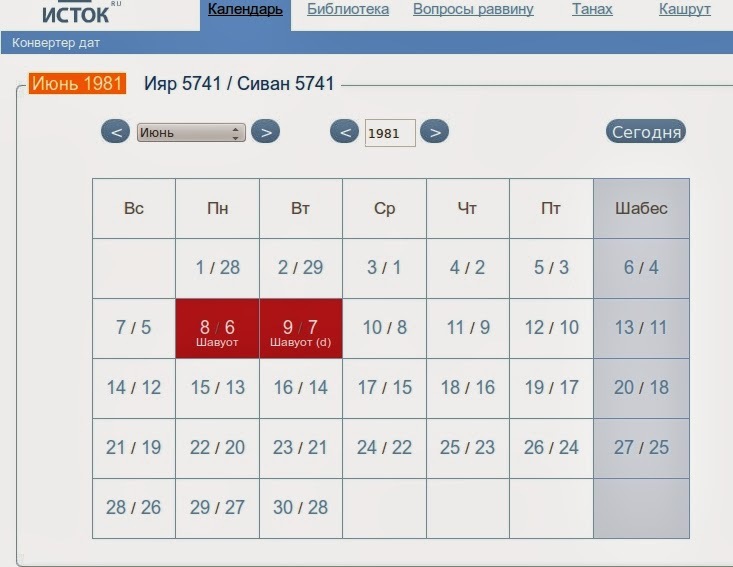 The military recorded the radiation levels and interpreted them as the beginning of a nuclear war with immediately bringing the units to a high degree of combat readiness and took measures to protect against weapons of mass destruction in places of their deployment in all areas of radioactive fallout. Each unit independently began to take measures for protection from weapons of mass destruction – all shifts of rocket pilots were simultaneously closed in the underground compartments with autonomous life-support whereas their wives and children remained on the surface with all the consequences for them and were in terror for their fathers and husbands – officers underground. The military know full well what contamination is all about and how important is the speed of taking measures to protect the population, because the maximum radiation levels happen in the first hours after a nuclear explosion and precipitation. The radiation level of the radioactive fallout is strongly dependent on the time elapsed since the explosion. This is due to the period of half decomposition and in the first hours and days radiation level falls quite heavily due to the decay of short-lived isotopes that comprise the bulk of the radioactive fallout. Further, the radiation level drops very slowly due to the particles with a long half-life. 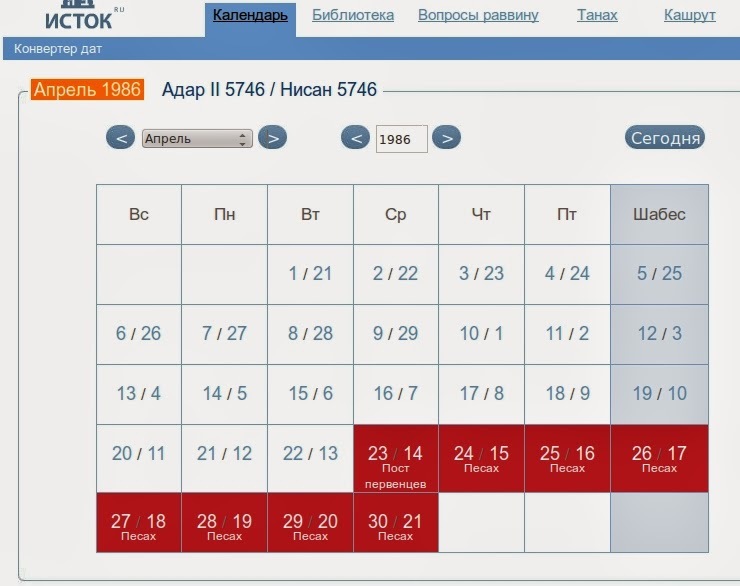 The rate of fall of levels of radiation is known to all graduates of secondary schools of the USSR from the course of basic military training and in modern items of measure is shown in figure 2. The decrease in the level of radiation occurs exponentially. Fig. 2. The decrease in the level of radiation occurs exponentially. Thus, the speed of action of forces and means of Civil defense is crucial to the survival of the population. That’s why the military immediately informed their headquarters about the levels of radiation in the places of their deployment and leaders in Moscow knew the situation about the levels of radioactive contamination from the first minutes of the radioactive fallout. Civil defense forces were actually hardly ever used and there was maximum damage to population, the intent is obvious. Journalist Igor Osipchuk talked with Colonel V. Mosiec, commander of military unit 74939 “Chernobyl-2” – station of radio intelligence and United States ballistic missiles tracking. Question: “Chernobyl-2 and Chernobyl nuclear station were built just nine kilometers from each other – is there any practical sense? Answer:-”…From the Chernobyl nuclear we conducted a power line. The energy we received from the transmission line coming from the side of Kiev. About the Chernobyl disaster I was informed a couple of hours after the explosion of the reactor. Immediately with the head of chemical protection major Shevchenko we rushed to city of Pripyat, measuring on our way radiation levels, and then at the request of the leadership of the city were involved in measurements in Pripyat and at the industrial base. At 11 o’clock in the morning I commanded to switch off our facility, as the ventilation system sucked in radiation together with the air, it would lead to the failure of computer technology. After that “Chernobyl-2” never worked. … After the Chernobyl disaster, the civilian population of the town was evacuated on the same day as that of Pripyat… (Other units remained on contaminated territories and women with children were not promptly evacuated). Question: -”How often did you pass the observation results to the command post? A: As for “Chernobyl-2″, the information from here was constantly passed to Solnechnogorsk-25″ Center of Soviet Army Divisions Specialists of Special Purpose training, because the object still was not officially on alert. It was planned to do at the end of 1986, but was prevented by the Chernobyl disaster. Object “Chernobyl-2″, as part of a system of anti-missile and anti-space air defense forces, was created with the sole purpose to register a nuclear attack on the USSR in the first two or three minutes after launching of ballistic rockets.” . If a military expert will plan a nuclear attack and radioactive contamination of the terrain, he would use the wind rose for the given region in a given period of time. For the European part of the USSR prevailing winds provide the picture of radioactive contamination, which the specialist will represent graphically. Thus, as a result of the terrorist act and radioactive contamination it was planned to kill the population in the territories that are shown in the figure below in red. Fig. 3. Winds reigning over Europe from January to July. Red indicates projected area of radioactive contamination. 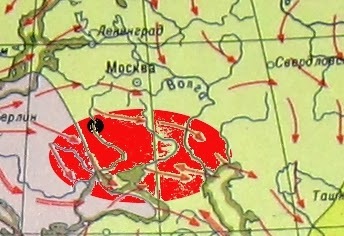 Black circle shows the Chernobyl nuclear power plant. There was actually a surprise to those who planned the attack, a sabotage. After the explosion, the wind sent radioactive fallout to the North and the maximum levels of radiation from short-lived isotopes began to fall to the North, and further West, fell on Europe. The final picture of contamination is shown on the map below (see Fig. 4). Fig. 4. Radioactive contamination of the European part of the continent. White color shows the zones for which there is no data. Fig. 5. The same as in Fig. 4, showing the distributions of pollution in Curie. The composition of radioactive contamination after the collapse of short-lived radioactive elements is shown in the table in figure 6. Fig 6 . The composition of radioactive contamination after the collapse of short-lived radioactive elements is shown in the table. Actually affected was the entire Northern hemisphere of the planet and gradually radioactive contamination has spread to the entire planet. Doctors noted a sharp increase in cancers as a result of radioactive contamination . Who is to blame for this terrorist attack, this sabotage? Traditionally, this issue is not included in the list of issues addressed by legal expertise and is a legal issue. In the practice of criminal investigation in Russia criminal forensic experts have the right to give investigative recommendations to the lawyers to develop versions for investigation and testing of suspects in a criminal case. So in this case the author of the article will do the same. Below are search recommendations for lawyers and intelligence officers of all countries affected by this terrorist attack. Gorbachev was an accomplice to the crime and there is no doubt about it. – Chairman of the State Committee of the USSR Minister of the USSR for Hydrometeorology and environmental monitoring, Y.A.Izrael. Y.A.Izrael personally participated in the research conducted at nuclear test sites (1954-1970.) after various accidents. He took a special part in 1986-1996 study of Chernobyl NPP accident consequences. The materials related to studies of radioactivity in the environment since the 50-ies of the 20th century are summarized by him in his monograph “Radioactive fallout from nuclear explosions and accidents” (1996) –he is a professional, information was intentionally concealed. Chernobyl was directly subordinated to the Ministry of Energy of the USSR. It was they who set the date of disconnection of the station, which was the date of the station explosion. It was headed by Anatoly Ivanovich Mayorets, who in 1986 became a member of the Central Committee of the CPSU. The event date: “… that the Energy Ministry that has sent an order to begin testing at 00: 00 on 25 April 1986” (p. 92. ). What was interesting in that date that drew attention in the USSR-Russia of all the specialists and the population? This Passover – Pesach! Figure 7 shows the calendar of Jewish holidays for April 1986 . Fig. 7. Shows the calendar of Jewish holidays for April 1986. Today the whole world already knows that the U.S., England and Israel (Rothschild & Co) plans attacks and wars, tying them to the dates of Jewish holidays. It’s been noticed that not only terrorist attacks and military operations are planned on Jewish holidays, but also carrying out those terrorist attacks is planned so that the funerals from the attacks would fall on the feasts of the Jews. Criminologists are well aware that symbolism shows a sustainable criminal pattern, it also indicates schizophrenia, as well as crimes committed on religious grounds. In this case it is necessary to consider religious motives. Thus, it is necessary to conclude that an international Jewish organized criminal group (OCG) was involved. The population of Russia, ordinary people and experts believe that the Chernobyl catastrophe was a terrorist attack conducted by the US and Jews to destroy the USSR. The Jewish mass media don’t deny it and strenuously promote it. Example: Israeli Prime Minister Ehud Olmert thanked the Soviet Jews for the collapse of the USSR and that they have made Israel more rich and prosperous. This rather cynical statement of the Israeli leader was announced at the solemn ceremony, devoted to the 40th anniversary of the beginning of the Soviet Jews ‘ struggle for the right to emigrate to Israel. Jews themselves often also support their authorship in the Chernobyl explosion and believe that their people have done it to destroy the USSR, because the USSR would not let them in go Israel. Such hiding of a Jewish organized criminal gang behind all the Jewish people is well known and such sweeping charges are called anti-Semitism. The speech of the Rabbi Eduard Hodos of Kharkov (Ukraine) is about the Chernobyl accident being the result of a terrorist attack involving Jewish sect Chabad . In the video, the Rabbi of Kharkov Eduard Hodos (Ukraine) explained to everyone that the Chernobyl accident was a terrorist attack, he supports the results of studies of the nuclear physicist N. In.Kravchuk and points at a radical Jewish sect from the USA, Chabad Lyubavich. This sect is well known in modern Russia, now the chief Rabbi of Russia since 2002 is Berl Lazar, Chabad Lyubavict member. Sect Chabad-Lubavitch is closely linked with the U.S. Department of State. Their well-known lobbyists are Joseph Isadore Lieberman, a U.S. Senator, and Albert Arnold Gore. 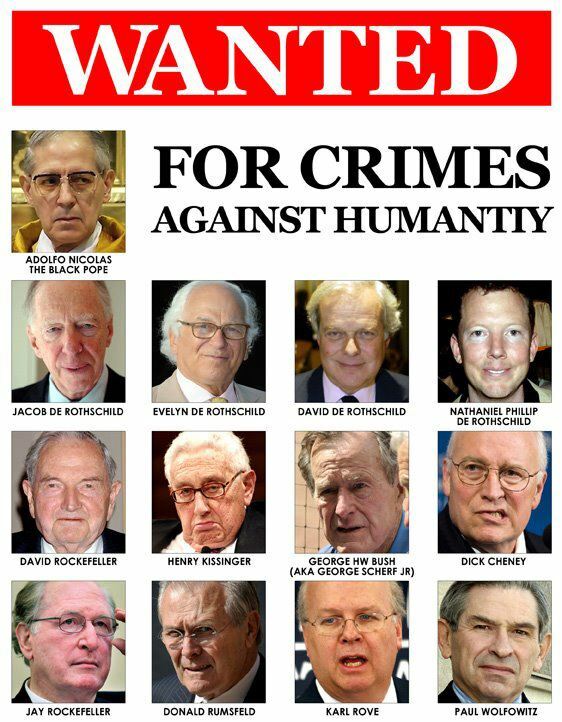 These same people are known as instigators of wars and falsifiers of the terrorist attack of 9/11 September 2001 in the USA. USA officers point at the international Jewish organized criminal group (Jewish OCG), which in their opinion is guilty of all the wars and terrorist attacks . In this case, it is necessary to clarify that under the law of return to Israel, the people converted to another faith are not considered as Jews. This is due to the fact that Israel stands on the position that being Jewish means Jewish religion first of all, not nationality. Russian experts agree with this statement based on the known real history of the Jewish people in Russia . Experts in Russia additionally indicate that Judaism is more of a disguise and the Jewish criminal gang really professes Satanism . Commitment of the Jewish criminal gang to symbolism gives all targeting on the enemy and reveals their history and context (see figure 9). Fig. 9. 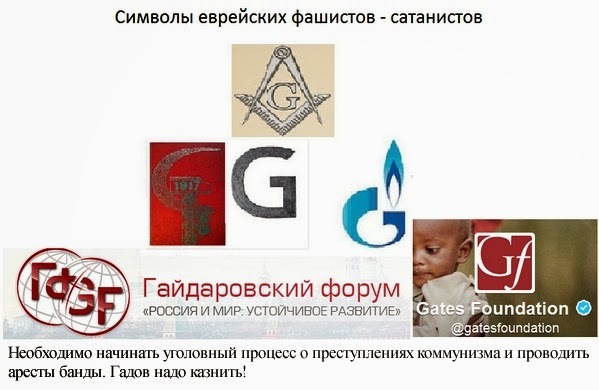 Symbols of international Satanic Jewish criminal gang. The list of representatives of international Jewish criminal gang (OCG) is known in Russia and is being prepared for lustration. The same thing should also be done in all other countries. The OCG should be prosecuted everywhere, the participants should be subject to arrest and trial, their property and funds should be confiscated on the account of the damages from their crimes . The international peer-reviewed journal of the U.S., where the reviewer is Professor at Stanford University, and now the U.S. Ambassador to Russia Michael McFaul, has published an article about the need to continue the Nuremberg trial on newly discovered evidence that the same applies to the activities of this gang . Returning to the goals of the terrorist attack in Chernobyl, it is necessary to consider the famous speech of the leader of the sect Chabad recognized by the sectarians as moshiachim, Schneerson. Shneerson is a known ideologue of Jewish extremism. Fig. 10. 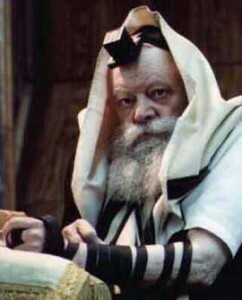 Menachem Mendel Schneerson (18.04.1902 — 12.06.1994). In his speech, which dates back to 1994, Shneerson specifies goals for the Jews – the extermination of the Slavs, the Russians, the capture of Khazaria. Khazaria is a fictional Jewish story about the alleged pre-existing Jewish Khazaria, which needs to be revived and restored . The performance of Schneerson in 1994 was before the war in Chechnya, which was also conducted with the goal of capturing Khazaria . Let’s carry out a comparative study of the territories which Shneerson indicates as Jewish, and the pre-planned areas for radioactive contamination from the Chernobyl nuclear power plant explosion. 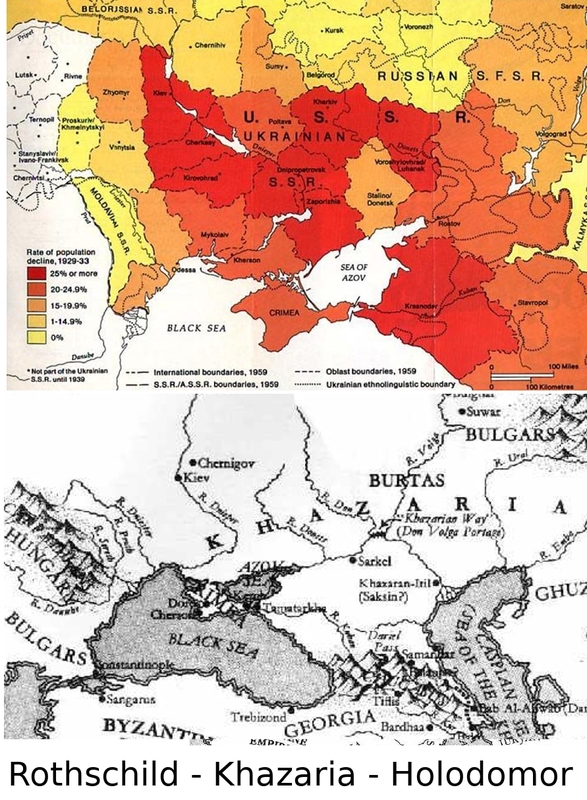 When comparing there is an observed coincidence that allows to make a conclusion about the deliberate explosion of the Chernobyl nuclear power plant in order to kill the population on the territory of fictional Jews of Khazaria, see figure 11. Fig. 11. Above is shown the same as on pic 3 -the expected radioactive contamination from the Chernobyl nuclear power plant explosion. The population in these areas has previously been actively exterminated in the 20th century – the artificial famines (Holodomor in 1932-33) and deportations were here, see figure 12. Fig. 12. Fictional Jewish Khazaria and the territory of the Holodomor victims of 1930-32 years. Additional information on the case: On TV channel “Russia” was shown a film by producer Sladkov with information that in the 1950-60-ies in the U.S. there were conducted studies on the effects of radiation on mammals. As a result of the research it was established that the mammals lost their reproductive function . Thus, the aim of the attack was not only the mass murder of the population directly after the attack, but also radioactive attack with the purpose of reproductive dysfunction of the population living on the territory, i.e. cleaning of the territory from people. These technologies are actively developed and funded by the Rockefeller Foundation, the Gates Foundation has been involved in the development of the reduction of population through vaccination. In connection with the submitted information, it is necessary to immediately prevent mass vaccination of the population of Russia, Ukraine and Belorussia in order to avoid other acts of sabotage and terror for the purpose of genocide. . The Gates Foundation and the government of England also act as the main investors of projects to develop genetically modified foods (GMOs) . “Gates mentioned about it in a private conference in Long Beach, California, called the TED 2010 Conference in his speech on “Renewing to zero!” Along with his absurd from the point of view of science proposal to artificially reduce CO2 emissions worldwide to zero by 2050, approximately at fourth to a half minute of his speech, Gates said: “First we got population. In the world today there are 6.8 billion people. This number will increase to about 9 billion. Now, if we really do a great job on new vaccines, healthcare, reproductive health, we’ll reduce it, perhaps by 10 or 15 percent” . Additional legal grounds for attracting international Jewish OCG to criminal charge. “It must be fundamentally resolved, that every government in the world can demand the extradition of the military, who during the fighting posed a threat to the ecology as a result of intentional or unintentional actions. The reason for this may be the decisions and recommendations of the International Association of Penal Law – IAPL (Paris, 1979), which states that the strengthening of criminal liability for environmental crimes of citizens and legal persons must be considered a priority. When causing environmental harm, a legal entity (the leaders of the army, of the country?) can and should be liable to penal consequences caused by acts of harm committed by bodies and heads of the legal entity. The object of environmental crimes is broad in its content: the preservation of the conditions of existence of all life on Earth and on the territory of the attacked state, as a part of it. For this reason, in my opinion, it is enough to make every government in the world to see the threat to the lives of its citizens and demand extradition of military commanders, considering them as ordinary criminals, who they actually are when they are planning combat operations directly or near atomic, chemical and other dangerous objects. It is necessary to modify the legislation to make this possible. It is not excluded that it is possible already now. The threat of criminal liability for the military might serve the peace cause much better than any other evidence” . Example: Operation Opera (also known as operation Babylon”) – a military operation conducted by the Israeli air force to destroy a nuclear reactor “Osirak” of French production on the territory of Iraq. The operation involved the following aircraft: F-16A: from squadron 117 – boards 107, 113, 118, 129; from 110 squadron – board 239, 240, 243 (pilot Ilan Ramon) and 249. Each aircraft of the strike group (8 F-16A) was equipped with two unguided bombs Mark 84. The operation was carried out on June 7, 1981. A new day for the Jews begins with the sunset of the previous day. The bombing held at sunset at 18:35 – the video of the attack posted online. Fig. 13. Jewish holidays calendar JUNE 1981. Special services must act ruthlessly! This is not just a Jewish criminal group, but Jewish fascism –absolute evil. Their God is Satan! February 2, 2019 in REALPOLITIK - The Geo-Political Chessboard.